Hello everyone and welcome back to another edition of the Wordless Wednesday! Thanks to my friend Deb for hosting this each and every week over at Focused on the Magic, it’s a great tradition and one I enjoy writing about nearly every week. Today’s theme was Hats, Caps, Bonnets, and Bows — but for me, I didn’t have a picture that just worked with that particular theme. However, I do have some that come close. 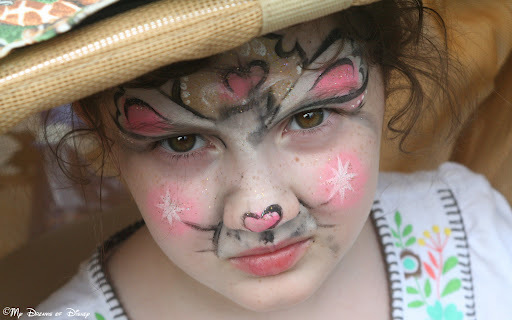 I am, of course, referring to the time when Sophie wanted to have her face painted over at Disney’s Animal Kingdom park. As you can see in these pictures, the person that did her face worked very meticulously on it, and as far as I am aware, you can still get your face painted over at Dinoland, U.S.A.! Please correct me if I’m wrong in that statement. Also, the price was pretty reasonable, so go for it if your child is interested! Now, though, enough chit-chat, it’s on to some pictures! As always, click on the button to see the rest of the entries for this week, and thanks for stopping by! A few smudges in the hot Animal Kingdom day.